While the calligraphy that was housed here is a treasure in our history (it will find the right home), the structure that housed it took up a lot of space. 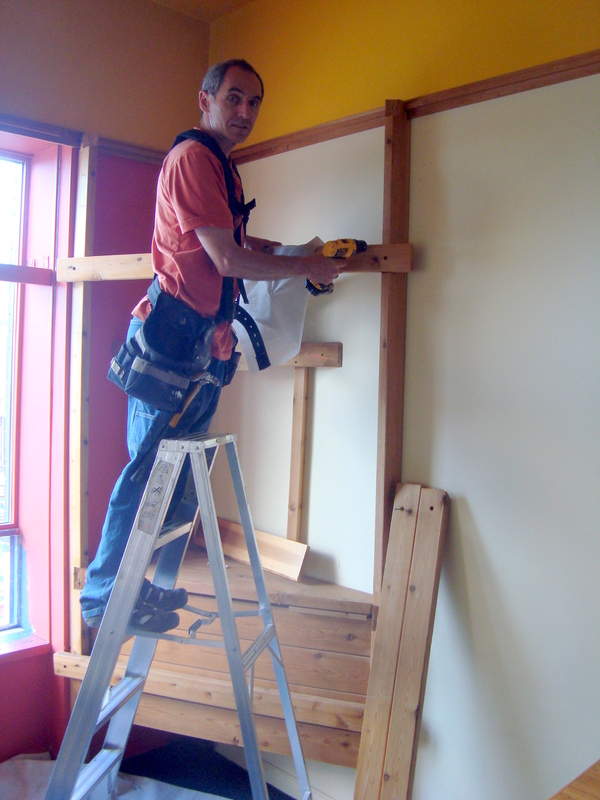 Fred Cohen dismantles the out-of-date wood frame. 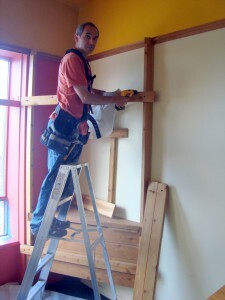 Next time you’re in the Shambhala Centre, you’ll notice some small changes that are already making a big difference. In the community room, we’ve removed the Japanese paper ceiling treatment (which was maybe twenty years old and discoloured with years of dust) and the corner calligraphy display. The room already feels a bit more airy. Our view is to create a more cheerful, welcoming environment. Because Shambhala is partly about spaciousness, we are beginning with removing obstacles, in this case literal ones. The big tables, the wooden corner structure that held the calligraphy, and the double doors to the community room all create a bottleneck effect for people who have to negotiate an obstacle course just to get a cup of tea. The Sacred Space Working Group has been contemplating and developing proposals to uplift our centre to better manifest and express basic goodness and Shambhala culture and society. 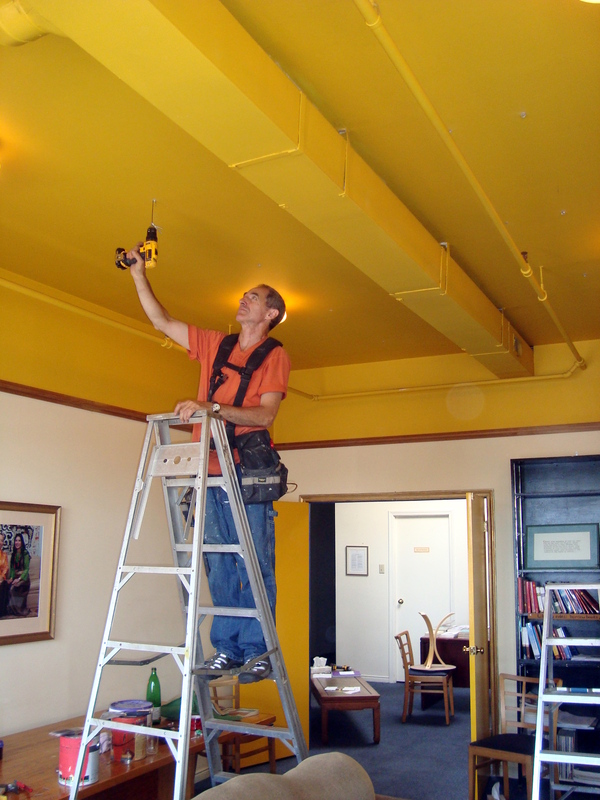 By uplift we mean renew and refresh, for example, by painting our rather grubby-looking walls and cleaning out what is no longer useful. But uplifting our space can also mean rethinking/redesigning certain areas so that they more welcoming and workable. The abrupt and spontaneous process that brings authentic presence is raising windhorse, or lungta, which is basically rousing the energy of basic goodness into a wind of delight and power… Raising windhorse is a way to cast out depression and doubt on the spot. It is not a form of exorcism but a cheering-up process. —Chögyam Trungpa Rinpoche, Shambhala: The Sacred Path of the Warrior, 160-61. We’ve asked for your input and you’ve responded! Your feedback has brought forth some great ideas, but we are also learning a lot about who we are as a community. The prospect of change can bring up a lot of things. For example, a number of people have said they feel left out—that some folks are in the know but no one else really knows what’s going on. In fact, there isn’t much of an “inner circle”—everything that happens in the centre is a result of people’s generosity with their efforts and time. The people who are listening to feedback and implementing changes are simply volunteers who stepped forward. The people who communicate these efforts are also volunteers. We realize how important it is to get the word out so this blog space will offer regular updates on what’s going on. 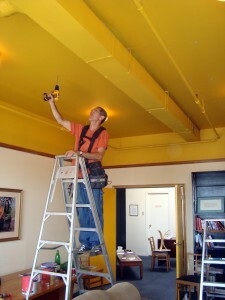 Fred Cohen removing the dusty paper drapery in the community room. Other people describe how renewing the centre brings up questions about our future: what are our long-term hopes and dreams? How might we make it possible to buy our own building? What about fundraising? What are our aspirations as a community? How healthy are we as a family and how can we take care of our health? Lots of people are excited about making the place brighter and have listed dozens of ways we can accomplish that. And of course some people feel uncomfortable about making any changes at all. As in meditation practice, we acknowledge all of these things as part of our inherent wisdom and keep our minds on this delightful process of cheering up. Draw, write, or paste images on the flip-chart paper posted on the community bulletin board in the coat room or in the notebook on the coffee table. Send an email to Fred Cohen, Head of Environment, or talk to a member of the working group. Offer your skills, time, expertise (interior design? ), or money (buy a lamp, a chair?). Email Fred or sign up on the sheet provided beneath the bulletin board in the coat room. Join in the conversation when the sacred spaces group presents the plan to the community and council on 16 and 17 July. Volunteer! We will be rolling up our sleeves for the nuts-and-bolts (and paint and cleaning) work throughout August. This is an exciting time in our community and we are inspired to be a part of it!